A Jyotirlingam (Sanskrit: ज्योतिरिनगम ) is a focal point, or seat, of silence, and represents the great deity Shiva, the embodiment of silence. Jyoti means 'radiance' and lingam the 'mark or sign' of Shiva, or a symbol of the pineal gland; Jyotir Lingam thus means the The Radiant sign of The Almighty. There are twelve traditional Jyotirlinga shrines in India. It is believed that Lord Shiva first manifested himself as a Jyotirlinga on the night of the Ardra Nakshatra. It is assumed that a person who reaches a higher level of spiritual attainment can see these lingas as columns of fire piercing through the earth. According to Śiva Mahāpurāṇa, once Brahma and Vishnu had an argument over their relative supremacy. To test them, Shiva pierced the three worlds as a huge endless pillar of light, the jyotirlinga. Vishnu and Brahma split their ways to downwards and upwards respectively to find the end of the light in either directions. Brahma lied that he found out the end, while Vishnu conceded his defeat. Shiva appeared as a second pillar of light and cursed Brahma that he would have no place in Vedic Yagya (ceremonies) while Vishnu would be worshipped till the end of eternity. The jyotirlinga is the supreme partless reality, out of which Shiva partly appears. The jyothirlinga shrines thus are places where Shiva appeared as a fiery column of light. Originally there were believed to be 64 jyothirlingas while 12 of them are considered to be very auspicious and holy. Each of the twelve jyothirlinga sites take the name of the presiding deity, each considered a different manifestation of Shiva. At all these sites, the primary image is lingam representing the beginningless and endless Stambha pillar, symbolizing the infinite nature of Shiva. हिमालये तु केदारं घुश्मेशं च शिवालये॥ Himālaye tu Kedāraṃ Ghuśmeśaṃ ca Śivālaye Kedar (Kedarnath) in Himalayas and Gushmesh (Gushmeshwar) in Shivalaya (Shiwar). सप्तजन्मकृतं पापं स्मरणेन विनश्यति॥ saptajanmakṛtaṃ pāpaṃ smaraṇena vinaśyati is relieved of all sins committed in past seven lives. कर्मक्षयो भवेत्तस्य यस्य तुष्टो महेश्वराः॥: karmakṣayo bhavettasya yasya tuṣṭo maheśvarāḥ and one's karma gets eliminated as Maheshwara gets satisfied to the worship. 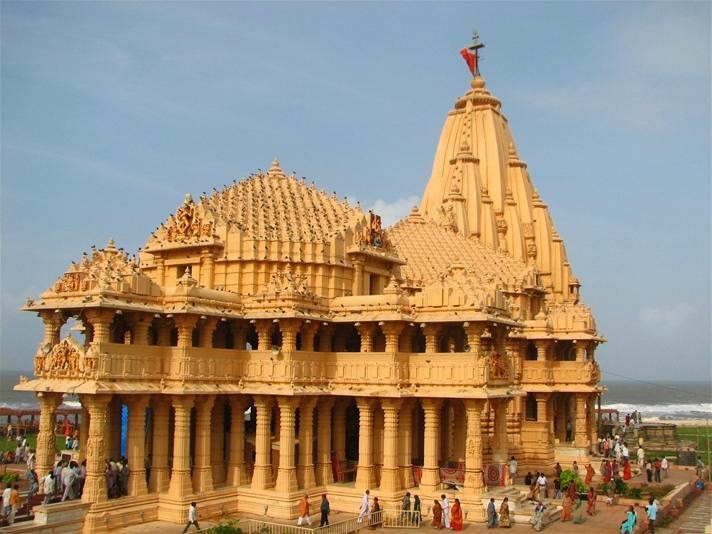 1 Somnath Gujarat Prabhas Patan,Saurashtra Somnath is traditionally considered the first pilgrimage site: the Dwadash Jyotirlinga pilgrimage begins with the Somnath Temple. The temple, that was destroyed and re-built sixteen times, is held in reverence throughout India and is rich in legend, tradition, and history. It is located at Prabhas Patan (Somnath - Veraval) in Saurashtra in Gujarat. 2 Mallikārjuna Swāmi Andhra Pradesh Srisailam Mallikārjuna, also called Śrīśaila, is located on a mountain on the river Krishna. Śrīśailaṃ, in Kurnool District in Rayalaseema enshrines Mallikarjuna in an ancient temple that is architecturally and sculpturally rich.It is one place where Shakti peetha and Jyotirlingam are together. Adi Shankara composed his Sivananda Lahiri here. 4 Omkareshwar Madhya Pradesh Island in theNarmada River,Omkareshwar Omkareshwar is in Madhya Pradesh on an island in the Narmada River and home to a Jyotirlinga shrine and the Mamaleshwar temple. 5 Kedarnath Uttarakhand Kedarnath Kedarnath in Uttarakhand is revered as the northernmost and the closest Jyotirlinga to Lord Shiva's eternal abode of Mount Kailash. It is considered to be 1/2 jyotirlinga along with Pashupatinath in Nepal. Kedarnath forms a part of the smaller Char Dham pilgrimage circuit of Hinduism. Kedarnath, nestled in the snow-clad Himalayas, is an ancient shrine, rich in legend and tradition. It is accessible only by foot, and only for six months a year. It is also one of thePadal Petra Stalam of Vada Naadu mentioned in Thevaaram. The other half of Kedarnath is Pashupatinath in Nepal. Shiva assumed the form of wild boar and dived into the earth at Kedarnath to emerge at Pashupatinath. Pure ghee is applied at Kedarnath lingam as the boar was injured. Bhimashankar Bhimashankar is very much debated. There is a Bhimashankara temple near Pune (pictured) in Maharashtra, which was referred to as Daakini country, but Kashipur in Uttarakhand was also referred to as Daakini country in ancient days and a Bhimashkar Temple known as ShreeMoteshwar Mahadev is present there. Another Bhimashankar is in the Sahyadri range ofMaharashtra. The Bhimashankar temple near Guwahati, Assam is the jyotirlinga according to Sivapuran. According to "LINGA PURAN", Bhimasankar temple in Bhimpur near Gunupur of Rayagada district in South Orissa is also believed as Bhimasankar Jyotirlinga, which is situated at the western part of the holy Mahendragiri mountains and at the river bank of Mahendratanaya(which is also believed as the Daakini area by many historian), was excavated in the year 1974, having quadrangular Shakti around the Linga and decorated by a Upavita as per the puran. 7 Kashi Vishwanath Temple Uttar Pradesh Varanasi Kashi Vishwanath Temple in Varanasi, Uttar Pradesh is home to the Vishwanath Jyotirlinga shrine, which is perhaps the most sacred of Hindu shrines. It is also one of the Padal Petra Stalam of Vada Naadu mentioned in Thevaaram. The temple is situated in Varanasi the holiest existing place of Hindus, where at least once in life a Hindu is expected to do pilgrimage, and if possible, also pour the remains of cremated ancestors on the River Ganges. The temple stands on the western bank of the holy river Ganges, and is one of the twelve Jyotirlingas. It is the holiest of all Shiva temples. The main deity is known by the name Vishwanath or Vishweshwarameaning Ruler of the universe. The temple town, which claims to be the oldest living city in the world, with 3500 years of documented history, is also called Kashi and hence the temple is popularly called Kashi Vishwanath Temple. 8 Trimbakeshwar Shiva Temple Maharashtra Trimbakeshwar, Near Nashik Baijanath Jyotirlinga Temple(also known as Baidyanath Dham)is located in Deoghar, Jharkhand . In the month of Shravana millions of devotee visit the temple. Bholebaba darshan during Shravan month attracts devotees from across India and overseas.Trimbakeshwar Temple, near Nasik in Maharashtra, is a Jyotirlinga shrine associated with the origin of the Godavari River. It is believed that once Ravan worshipped Shiva for years and requested his god (Shiva) to come to Lanka . Shiva manifested as shivaling and asked Ravan to not to put down anywhere until he takes it to Lanka. Vishnu intercepted Ravana in between and convinced him to keep it for sometime. Since then shiva resides as Vaijanath in Deoghar. 10 Nageshvara Jyotirlinga Gujarat Dwaraka Nageshvara Jyotirlinga is one of the 12 Jyotirlinga shrines mentioned in the Shiva Purana (Śatarudra Saṁhitā,Ch.42/2-4, referred as "nagesham darukavane"). Nageshvara is believed as the first Jyotirlinga on the earth. There are three major shrines in India which are believed as identical to this Jyotirlinga. Those are the Jageshwar temple near Almora in Uttarakhand state, the Nageshwara temple near Dwaraka in Gujarat state and the Nagnath temple in Aundha in Maharashtra state. 11 Rameshwar Tamil Nadu Rameswaram Rameswaram in Tamil Nadu is home to the vast Ramalingeswarar Jyotirlinga temple and is revered as the southernmost of the twelve Jyotirlinga shrines of India. It enshrines theRameśvara ("Lord of Rama") pillar. It is also one of the Padal Petra Stalam of Pandya Naadumentioned in Thevaaram. 12 Grishneshwar Maharashtra Aurangabad Grishneshwar Jyotirlinga is one of the 12 Jyotirlinga shrines mentioned in the Shiva Purana (kotirudra sahinta,Ch.32-33 referred as "Grishneshwar Jyotirlinga"). Grishneshwar is believed as the Last or 12th (twelfth) Jyotirlinga on the earth. This pilgrimage site is located at a village called Verul which lies at a distance of 11 km from Daulatabad and 30 km from Aurangabad. It lies at a close proximity to the Ellora caves. Some of the other major Shiva temples that are not listed as Jyotirlingas are Amarnath in Jammu and Kashmir, India, Pashupatinath in Kathmandu, Nepal. Maharishi added that it should not just be a tower to be seen, but a home of Jyotish and Vedic Mathematics—all the twelve fields of knowledge: Education, Health, Agriculture, Trade and Commerce, Defence, Science and Technology, Communication, Religion and Culture, Administration, Law and Order, and Finance and Planning. ‘Now, select the countries, and building will be no problem,’ Maharishi said. 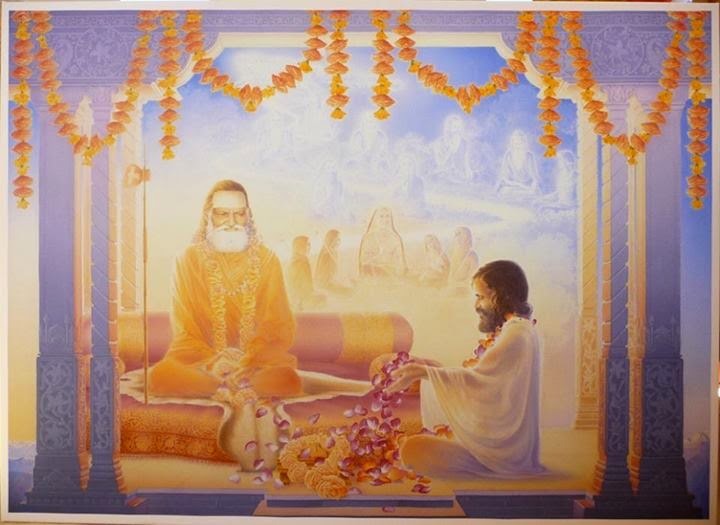 Maharishi explained that the Maharishi Towers of Invincibility will be the representations of the twelve Jyotir Lingas in India, which express the full value of Shiva, pure Cosmic Intelligence, the Constitution of the Universe, the point where the Grace of Guru Dev is most lively to bless all mankind. These will also be where people practice their Yogic Flying for national Invincibility in each country. 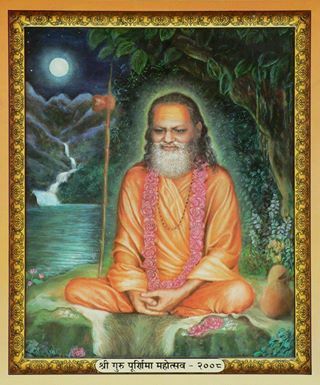 The 48 Vedic Pandit villages are named Brahmananda Saraswati Nagars in honor of Maharishi Mahesh Yogi’s spiritual master, Swami Brahmananda Saraswati, former Shankaracharya of Jyotir Math. The sites of the Brahmananda Saraswati Nagars center around 12 locations long regarded in India as seats of silence, known as Jyotir Lingas. Each of these 12 locations has four Brahmananda Saraswati Nagars associated with it—one at the Jyotir Linga itself, and three others in three, usually nearby, cities. Each Brahmananda Saraswati Nagar in turn takes responsibility for four countries in the world. In this way, all 192 countries in the world will be taken care of by the Vedic Pandits through their performances for peace and prosperity. **Guwahati is famous as a Shakti Peeth, and Tripura is a very famous Devi Peeth. **In Hyderabad a major medical college will be built; Tirupati is the site of a beautiful Vishnu Peeth. **Raipur (Panduka) is the birthplace of Maharishi; Jabalpur is also closely associated with Maharishi. Mahakaleshwar is known as a Moksha Puri, and is a site for the Kumbh Mela; Bhopal is also a famous Shakti Peeth. 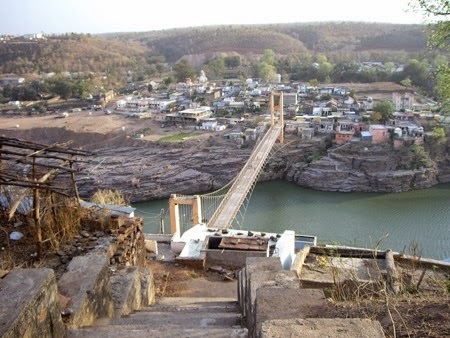 **Omkareshwar is a beautiful location on the Narmada River. Many have visited Prayag—it is a Moksha Puri, and a location for the Kumbh Mela; it is known as Tirth Raj—'king of all the pilgrimage centres'. Ayodhya is capital of Lord Raam and a Global Capital of the Global Country of World Peace. **Deoghar will be a great seat of learning; Mahakali is a great Shakti Peeth. **Bhimashankar is a major seat of learning; Bangalore will have a major medical college; Gokak will also be a beautiful seat of learning. **Rameshwaram is one of four special holy places of India; Chennai is a Moksha Puri, also a great seat of learning. Thiruvananta Puram (formerly known as Trivandrum) is where Maharishi gave his first lectures, and is also a great Vishnu Peeth. **Dwarka is a Moksha Peeth, a great seat of learning, and the capital of Lord Krishna. Jaipur and Jodhpur are great seats of learning, and there learning centres will be established. **Varanasi is a great Moksha Puri and traditional seat of knowledge; Patna is a great Shakti Peeth; Darbhanga is a great seat of learning. **Nasik is a site of the Kumbh Mela; Mumbai has a great Mahalakshmi temple; Nagpur has a beautiful Devi Peeth; Kolhapur also has a Mahalakshmi temple and is a famous pilgrimage site for Mahalakshmi. **Kedarnath is a very great Jyotir Linga, Haridwar is a place of Kumbh Mela, and a Moksha Puri; Janmu is a very famous Devi Peeth, as well as a Vishnu Peeth. **Mathura is famous as a Moksha Puri and the home of Lord Krishna; Puri is one of the four Dhams and a great Devi Peeth.